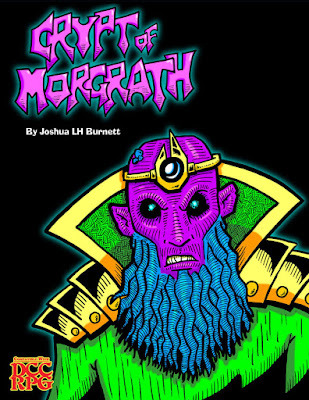 Crypt of Morgrath is a 1st level adventure written and illustrated by Joshua LH Burnett. It is published by JLHB Polytechnic. This was originally written by the author as an OSR dungeon in 2011, which he converted to Dungeon Crawl Classics. It was posted to his blog, and you can find the Crypts & Things version here. In fact, if you are interested in doing conversions of your own material, or of published material for your own use, examining both versions of this relatively short adventure might be worth your while. This is a short adventure, which was fun to read and should be fun to play. It is a bit on the linear side, but as it is not long this isn't much of a problem. The introduction could easily be modified, or even skipped, and the PCs would be none the worse for it. Because the adventure is short, there is no likelihood of a print version any time soon. However, the introductory text suggests a funnel taking place before this adventure. If the author created that funnel, and then bundled the two together - possibly with a mini bar-brawl as the end of the funnel - that could be sweet. This product is Pay What You Want, so there is no reason you shouldn't check it out.